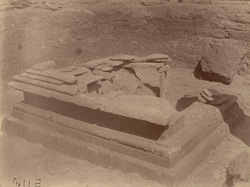 Photograph of a base of a stupa at Chakdarra, taken by Alexander E. Caddy around the 1880s. In the report 'Deputation of Mr. A.E. Caddy to the North-West Frontier for collecting Buddhistic remains in the Swat Valley and its vicinity' of 1895, Alexander Caddy wrote, "I am constantly being addressed by officers in the Swat valley, on the North-West Frontier, regarding the Buddhist remains which they frequently discover in the Swat valley and in its vicinity. During my travels in this country in the company of major Deane, I had opportunity for observing how the country abounds in remains of the works of these ancient people. There are many sites of ancient cities with their walls still standing, of towers, monasteries, abbeys and other structures, where intelligent and scientific exploration will in every probability yeld a rich harvest of Greek-Scythian and Greeko-Arian treasures."